So there I was, minding my own business, when the ship got top secret orders from the president to penetrate the sovereign twelve mile limit of Libya to catch a Soviet nuclear submarine, NATO code name "Victor." So we slowly and quietly sneak up and approach Libya and the Gulf of Sidhra, where Libya's dictator had decreed that any American warship discovered on the wrong side of the "Line of Death" from Tripoli to Benghazi would be fired upon. There was a Soviet anchorage near the shoreline. The Russians had been tipped off that we were coming, but they didn't know when, or they were given false intelligence saying we'd be there Thursday when we actually were in position Wednesday. We sailed into shallow waters rigged for ultraquiet, tip-toeing through the ship. Creeping up at bare steerageway, half a knot, until we pop up the periscope for a half second, enough to see the gigantic towering form of the Kirov, a Russian nuclear-powered battleship. Orders were to hide in the anchorage by hovering right beneath the Kirov. An amazing feat of ship control it took, to hover and thrust until we were directly right under the Kirov's colossal hull. We had maybe five feet under the keel to the bottom and only enough water above us that we could just barely pop up the periscope without it hitting Kirov's hull. For half a day we were there before the intel that we were coming arrived at the Russian anchorage, and the Kirov's active sonar lit up, transmitting so much power into the ocean that water on her sonar dome boiled and fish were killed within five hundred feet. That sonar sounded like a death ray, and was so loud it blasted into the hull. You could feel it in your chest, and you had to shout at a man standing next to you to be heard. Loud noise over a prolonged period causes fatigue. Over days and nights, it can cause pure madness. 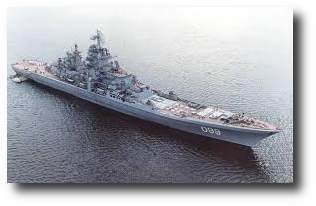 For six days we got hammered by Kirov's sonar. We were undetectable, because we were indistinguishable from the bottom, and sonars are designed not to hear echo returns from things that are ultra-close. We were invisible. Mad, but invisible. Finally, the sonar switches off. Something's afoot. We thrust out, pop up the periscope, and saw our prey, a Russian Victor class nuclear submarine a half mile away in the anchorage. The last boat was leaving it, and sailors and officers stood on its hull. Conn, Sonar, the overhead speaker rasped, the Victor has started his reactor and steam plant and warmed up his main engines. He'll be weighing anchor any minute. Sonar, Conn aye. The section tracking party was stationed, and within an hour the Rooskie pulled up the hook and sailed for deep water. With us shadowing him, he pulled the plug and submerged, and for forty days and forty nights we trailed him, two torpedo tube doors open, two weapons powered up. One false move, the Russian plunges to the bottom. For the 40 days and 40 nights we trailed the Victor, we ran out of food and had an incident where we scraped his paint (that's another story) and generally were bad-asses. 'Cuz that's how we rolled.